First of all I can’t believe it’s been 21 weeks! Now that I’ve recovered from module 3 and my brief hatred of my yoga mat, it’s time to make some resolutions before the final module and exams. 1. Read more consistently and attentively, especially the stuff I don’t like. 2. Practise the module quizzes. 3. Learn off the important muscles and exercises to strengthen them. 4. 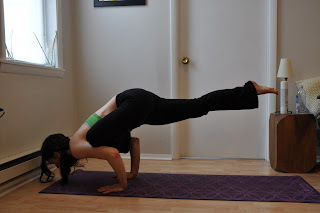 Do a headstand without the wall and get into Pincha Mayurasana and Adho Mukha Vrksasana without support. 5. Buy a new mat – one without biro and highlighter stains. This may be my reward for finishing the course! Came to lying on backs to stretch lengthways and towards the ceiling. Loosened out by shaking limbs in the air – aptly described as insect stuck on its back pose. Rock and rolled from Halasana to Dandasana several time and came to squat. Rolled up to Tadasana.